Hydrilla, a highly invasive plant, has been found in the Delaware & Raritan Canal. Fig. 1. Leaves of hydrilla are toothed and typically arranged in whorls of 5. Photo credit Heather Desko, NJWSA. For general hydrilla information, visit our Hydrilla Information Page, or view the Rutgers Factsheet. In July 2016, a significant population of hydrilla (Hydrilla verticillata), an aggressive invasive submersed aquatic plant, was discovered during aquatic vegetation removal via hydro-rake on a segment of the feeder section of the Delaware & Raritan Canal. Hydrilla is known as the “perfect weed”: it can grow in a wide range of water conditions; it easily reproduces and spreads by multiple methods; and itis difficult to eradicate. Hydrilla grows as slender stems with multiple branches (Fig. 1), can grow at a rate of 1 inch per day, and can reach lengths of up to 25 feet. The leaves of hydrilla are sharply toothed and are arranged in whorls of 4-8 leaflets, typically 5 leaflets (Fig. 1). 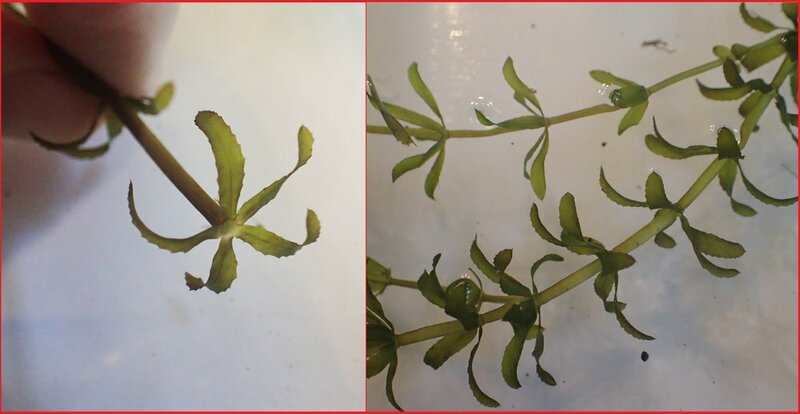 These key features are the distinguishing characteristics between hydrilla and the native Elodea Canadensis, which are arranged in whorls of 3 leaves with very fine serrations that require magnification to view. The rapid growth habits of hydrilla lead to the formation of dense mats that reduce the flow of water and can clog intakes, culverts, and pipes. This year, a submersed aquatic plant survey was completed for approximately 18 miles of the D&R Canal. Biologists confirmed rooted hydrilla in more than 13 miles of the surveyed segments. The New Jersey Water Supply Authority is working with Canal stake holders, including federal, state and local government agencies, water purveyors, non-profits, and other user groups to develop plans for management, monitoring, and education. There are several viable alternatives for effective control and containment of these nuisance aquatic plants, requiring a multi-year, multi-faceted management and outreach approach.